Funding to the Accessible City projects being led by Crown company Ōtākaro Limited, which is responsible for the delivery of three roading and transport projects worth $50 million, has been suspended in response to concerns voiced by the City’s residents and businesses. 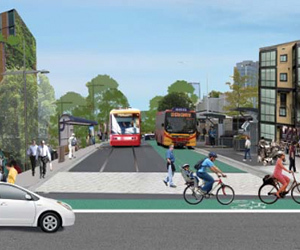 The Christchurch Accessible City plan designates areas including Victoria Street and St Asaph Street as “prioritised for walking and cycling”. According to Gerry Brownlee, the Minister supporting Greater Christchurch Regeneration, the proposed lack of adequate on-street parking and limited access had triggered concerns among residents and local business owners. “I don’t believe adequate on-street car parking has been provided for in Accessible City and while I commend the move towards a more cycle-friendly and walkable city, a balance needs to be struck and it should not be to the detriment of the city as a whole”, he added. Christchurch City Council, Ōtākaro staff and a group representing developers and business owners have since met to negotiate a productive way forward.